iBassist turns your iPad into a versatile bass player to jam or compose anywhere and create grooves for installed drum apps, so now your iPad jams enter a new level. Additionally, it sends progression chords by MIDI, so you can have any synth/piano on the background and a proper band jamming instantly. Bass lines are based in degrees, so you can apply any chord progression to any bass line. 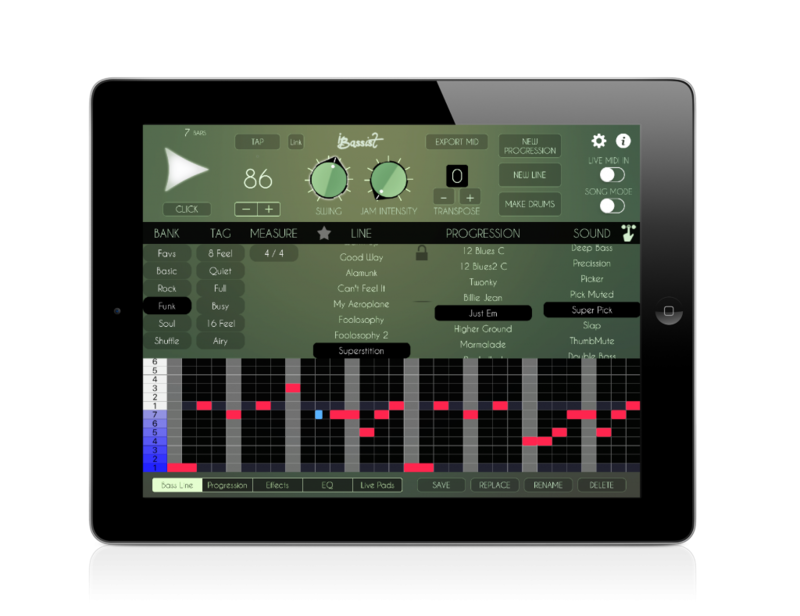 A valuable tool to apply different bass grooves to your songs. And the jam tool brings musical variations and new ideas on the way. The Chord Progression editor is quick, easy to use and allows to create or edit your progressions by choosing Key Notes – harmony by steps, midi detection or randomizing.